When I first saw this fan-art on the hyped geek website I thought it was very sad yet heartwarming. Im a big fan of anime and manga and grew up watching Naruto and One piece, two monsters in the anime and manga industry. Naruto was my childhood anime, and it ended back in 2014. It had me pretty upset for a while. Luckily my new favorite anime One piece is not ending anytime soon My Hero Academia is one of the newer Anime that has risen to popularity. It is one of the best manga at the moment, and the main character ,Deku, is very relatable, sweet, strong, and very well written. The anime itself is beautifully animated and because it has such a great story the creator of Naruto even praised this up and coming work. A fan made the picture seen below and it starts with Naruto saying its up to Deku to inspire, teach, and entertain kids, teens, or whoever watches anime just like Naruto and his story did. Deku cries because Naruto’s story has ended and then looks at his hands and realized that its his turn to become great just like Naruto. It then has Naruto saying his goodbye to Luffy the protagonist of One Piece, since its still on going and his journey isn’t over. 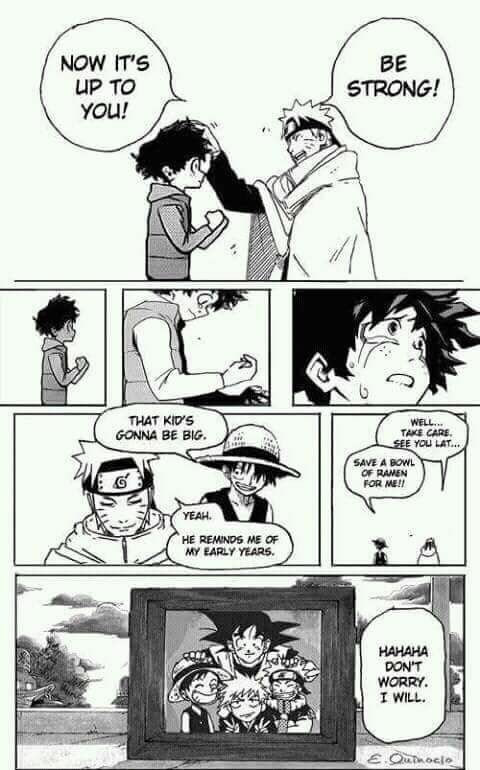 Luffy says to save him a bowl of Ramen, Narutos favorite food, because one day his story will also be over and he will join Naruto as one of the greatest finished mangas. They both agree Deku will be big, meaning its going to possibly get as popular as they were and ends with a framed picture of the protagonist of all the 4 top selling mangas and animes of my time. The image now makes me happy every time I see it. The creator of it captured a feeling of nostalgia and hope for the future in the anime and manga industry. Also, if you were wondering what I was talking about with the words Anime and manga, in simple terms Anime is Japanese animation. Anime is based of a manga which is the book version, the story being animated. Pretend you read a book then it became a tv show, movie, Netflix show, etc. Only this time you cant say the book is better then the movie. Great post! A nice series of examples, links and format.